Welcome to the Criminal Minds Round Table. When we were positing names for this blog, and Sir Bedivere suggested Criminal Minds Round Table, we knew immediately that was the perfect name for our blog. It fit in so many ways. Many fans, and Ed Bernero (Criminal Minds' former Showrunner and Executive Producer) himself, compare the show and its characters to The Arthurian Legend and the Knights of the Round Table. Mr. Bernero even went so far as to say that he knew that the stories had to be “Arthurian” to appeal to the most people. 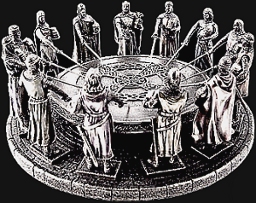 The team meets to brief cases at a round table, and there are many parallels between our BAU team and the Knights and other Arthurian characters. In addition, a Round Table discussion is what we want to have here about any and all topics Criminal Minds-related. In a Round Table discussion, each participant has equal status and equal time to present views. And finally, since this is going to be a group effort amongst a group of Criminal Minds fans, we are going to take turns around the table, with each of us posting about the show, our favorite characters and our favorite actors on the show. So, please join Lady Guinevere, Sir Tristan, Sir Galahad, Sir Gawain, Sir Perceval, Sir Bedivere, Morgana, Sir Elyan the White, Chaucer, Merlin, and me, The Lady of the Lake (an extra-added benefit was that we got to choose cool names for our alter egos), in exploring our favorite show, actors, and the Arthurian legend. Where Do You Stand On About The New Agent? What did you think of 'The Storm'? What did you think of 'Devil's Backbone'? What did you think of CM:BB 'Citizen of the World'? What did you think of 'Inner Beauty'? What did you think of CM:BB "Love Interrupted"? CM:BB What did you think of 'Love Interrupted'? Criminal Minds:what did you think of 'Beautiful Disaster'? What did you think of 'Beautiful Disaster'? What did you think of CM:BB "Whispering Death"? What did you think of CM:BB 'Whispering death'? What did you think of CM:BB 'Lonely Heart'? What did you think of CM:BB 'Denial'? CM:BB What did you think of 'Denial'? What did you think of 'Tribute'? CM:BB what did you think of 'Harvested'? What did you think of 'The Sandman'? What did you think of 'Derek'? What did you think of 'A Badge and A Gun'? What did you think of 'Hostage'? What did you think of 'The Bond'? What did you think of 'Drive'? What did you think of 'Entropy'? What did you think of 'Future perfect'? What did you think of 'Internal Affair'? What did you think of 'Awake' ? What did you think of 'Awake'? What did you think of 'Target Rich' ? What did you think of 'Target Rich'? What did you think of 'Pariahville' ? What did you think of 'Pariahville'? What did you think of 'The Night Watch'? What did you think of 'Outlaw'? What did you think of 'T'ill death do Us Part'? What did you think of 'The Witness'? What did you think of 'The Job'?